"Do you think just because these guys (Federal Marshalls) have me you can speak to me this way?" How does it feel to live in a fishbowl? How does it feel to lose all of your money and to live in a fishbowl? How does it feel to be a mobster ratted out and forced to turn stoolie, lose all your money and live in a fishbowl—as your family falls apart before your very eyes? Welcome to Bobby Batton's World. This film is a gripping tale of a family that never was, being forced into exile and there attempting to discover what it actually takes to be a family. Here is the mobster movie forgotten, the one that always ends with the stoolie being killed or taking his own life in an act of "Family" contrition. HBO's original feature, Witness Protection, directed by Emmy Award-winner® Richard Pearce, is an examination of a family in flux, learning to cope with a new life in a strange place with new names. How does a mobster stop being a mobster? How does a guy who is used to hanging out with the boys and chasing the action, learn to live in the confines of a home locked and guarded 24-hours-a-day by Federal Marshall? How does he deal with the loss of control? How does he handle the conflicted emotions his family has for his selfishness all these years, bringing them unwittingly and (relatively) innocently into exile from their family and friends with him? How does one deal when one can no longer escape into the company of men? 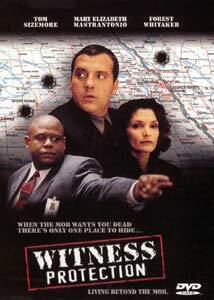 Luckily for such a compelling drama, Witness Protection is supported by several fine performances from Tom Sizemore (Bobby), Mary Elizabeth Mastrantonio (Cindy), Shawn Hatosy (Sean) and Forest Whitaker as Marshal Steve. You can't but come away impressed with this slice of claustrophobic life, and the way this cast help make this fictional account ring true. Sizemore was nominated for a Golden Globe® for his performance as Bobby Batton. Image Transfer Review: It's not very often that I can praise a full frame transfer, even if it's in its native aspect ratio...but this may be the best I've seen yet. The colors are sharp, flesh tones are accurately represented and the contrast levels are excellent. The print is very clean, with no more than a fleck or two of aggregate dirt. I noticed only minor aliasing distortion, few compression artifacts and no distinguishable edge enhancement. Every pock mark of Tom Sizemore's, every freckle on young Shawn Hatosy, and the wrinkles on Mary Elizabeth Mastrantonio's face exhibit the granular detail you can expect to see on this disc. Audio Transfer Review: Let's get it straight. I haven't heard a Dolby Surround 2.0 mix this good since Saving Private Ryan. No, I'm not kidding. There may have been very good 2.0 tracks in between, but I must have missed them. From the moment this film starts (automatically, by the way) I was taken aback by the power, of the intense base and unusually active surround field of Cliff Eidelman's excellent musical score. There are also some nice panning and other cross-field effects. I had to double check to be sure it wasn't in fact a DD5.1 track! Still, this is a dialogue driven vehicle, and the music and ambient surround sounds do not play a large role unless called for, allowing the center channel conversations to mostly be audible and understandable. There were a few moments here and there that I found it necessary to crank the volume, and once when I had to rewind and play the scene again to understand it. Extras Review: This a fairly Plain Jane disc, with little more than cast and crew bios and filmographies. I did learn that Mastrantonio is a Chicago native, and the Forest Whitaker's film debut was in none other than the venerable Fast Times At Ridegmont High (Did he work in the mall or the fast food joint). A Spanish language track, and English, French and Spanish subtitles round out the goods. I have long been a fan of HBO original programming, much of which has an extensive award-winning history. I therefore was not surprised that Witness Protection follows suit with its excellent character-based vehicle, driven by an all-star cast. The lack of supplements is this disc's only shortfall, but I recommend it nonetheless.